We end up speaking to a lot of people at trade shows, and one comment we frequently hear runs something like this: "We would love to eliminate print servers in our organization, but we have too many remote offices. We're too distributed to look for a simpler solution." Then we get to experience the fun of seeing the delight on their faces when we demonstrate PrinterLogic, and show them that the opposite is true. Any organization, no matter how distributed, has the ability to drastically reduce its remote server infrastructure by implementing PrinterLogic printer management software. And organizations that are highly distributed might even stand to benefit the most from migrating to PrinterLogic on account of increased sources of ROI. To put it another way: Eliminating print servers with PrinterLogic is not only possible, it can be profitable. Take CFCU Community Credit Union, for example. They're one of the largest credit unions in New York State. After dealing with 2-3 print server failures per week that would effectively bring down their entire enterprise print environment, CFCU was determined to eliminate all four of their print servers (two Citrix and two local) across ten offices. Once they adopted PrinterLogic as their print management solution, they were able to eliminate print servers altogether—plus all the productivity-sapping downtime those servers caused. And CFCU got some nice perks to boot, like a simplified end-user experience and the joy of never having to troubleshoot or upgrade a print server again. CFCU Community Credit Union isn't alone. 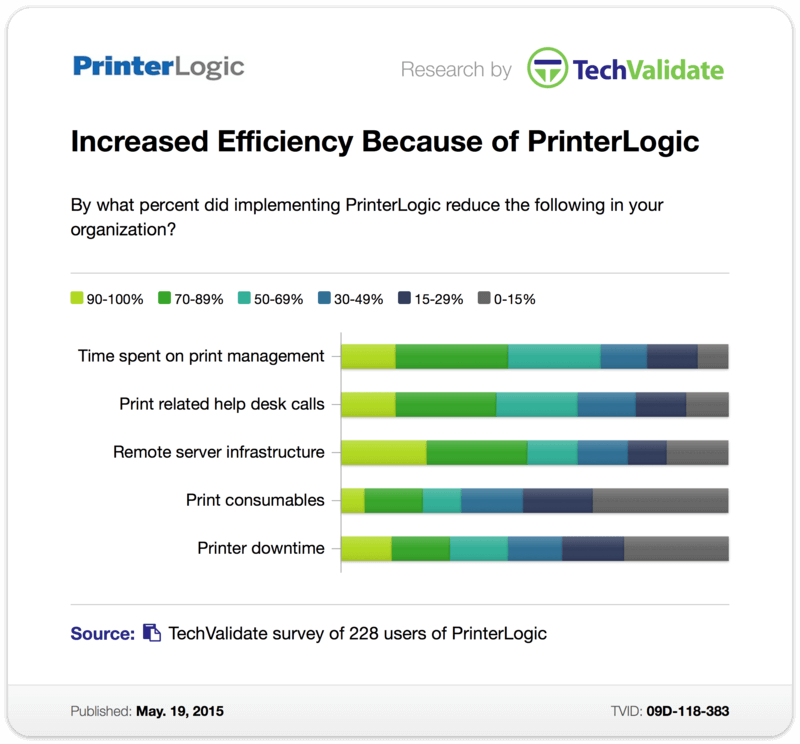 A recent survey by TechValidate of PrinterLogic's enterprise customers revealed that nearly a quarter of our customers, like CFCU, were able to eliminate between 90% and 100% of their print servers. Almost half of our customers were able to reduce remote print servers by over 70%. 61% were able to reduce their remote server infrastructure by more than 50%. APi Group, Inc. is in the process of eliminating all 160 of its print servers across as many global sites. The Belgian company Aquafin used PrinterLogic to eliminate four print servers across 100 locations. Zeus Industrial Products was able to eliminate the print servers in all four of its North American facilities, which include more than 1,600 users and 500 printers.